• To present experiences and lessons learned from recent disasters and programs. Asian Nations (ASEAN) Secretariat in Jakarta briefed participants on deliberations of the South East Asian Working Group Meeting on Regional Cooperation in Disaster Management. During the RCC, a review of the recommendations of the RCC1 let participants identify priorities for the future, and suggest practical ways to achieve implementation. With reference to priorities for capacity building for national disaster management systems, delegates identified: integrating disaster risk management (DRM) into national planning; strengthening national disaster management committees/agencies; developing disaster management plans; exchanging experience on legal and institutional arrangements; creating awareness and political support and building national disaster management information systems. With regards to regional initiatives for disaster management, the following priorities were recognized: creating awareness, political will and support for disaster management and mitigation; organizing an Asian regional multistakeholder conference on DRR; producing an Asian regional report on DRR; and developing vulnerability atlas for Asia. Finally, delegates recognized the following new action areas: fostering of sub-regional cooperation through periodic sub-regional meetings; strengthening of regional networking; formulation of neighborly search and rescue teams and organizing field trips to impact areas for postdisaster assessments. 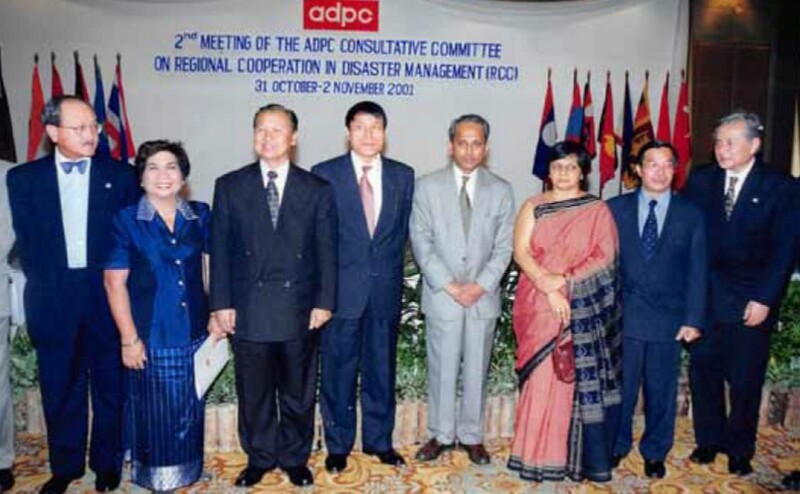 A key outcome of RCC2, in addition to the proposed program throughout the meeting, was the development of the Statement on Future Directions of the ADPC Consultative Committee of Regional Cooperation in Disaster Management. The statement encourages RCC countries to adopt a ‘Total Disaster Risk Management Strategy,’ which involves a comprehensive approach to multi-hazard disaster risk management and reduction, and includes prevention, mitigation and preparedness in addition to response and recovery. Key action areas were also recognized – namely building community level programs for preparedness and mitigation; capacity building of national disaster management systems; cooperation with sub-regional mechanisms such as ASEAN, The South Asian Association for Regional Cooperation (SAARC), South Pacific Applied Geoscience and Technology Commission (SOPAC), Mekong River Commission (MRC) and The International Centre for Integrated Mountain Development (ICIMOD); and regional initiatives to create awareness and promote political will. The statement served as an important means of conceptualising and developing practical cooperative programs between member countries at the regional and sub-regional levels. RCC meetings were agreed to be held on an annual basis with a thematic focus. ADPC was requested to continue as a facilitator and convener of this consultative mechanism and serve as the regional focal point and a technical resource for the RCC in disaster management.